I've been playing round with my new NX70 camcorder, very nice it is too. I've run into a problem with the audio in 50p mode when using PCM. With the NX70, you have two audio options: Dolby Digital and Linear PCM. When I pull a 50p file with PCM audio into Windows (I have tried two separate PCs) I can't get the audio to play at all in any media player, Premiere Pro CS5 or CS5.5, they all "can't see" that there's an audio track. It's not silence, the track is completely missing. I'm using Windows 7 64 bit, 8GB RAM with ATI Radeon HD 4800 Graphics (I don't think it's a hardware thing). In-camera is fine, the audio plays back. Using the Sony Content Manager, it plays the 50p video from the camera with audio OK, and if you transfer the files to the PC using the Sony Software, or manually copying, then the Sony software still plays the audio fine. I've been through all the permutations: 50i, 50p, 25p, each with PCM and Dolby Digital. These are all fine: 50i + DD, 50i + PCM, 25p + DD, 25p + PCM, 50p + DD. The fact that PCM works fine in other bitrates suggests to me it's not an audio codec problem. The fact that the Sony software can play the same files back on my hard disk _with_ audio, suggests that the audio actually is there. The only difference with these 50p files is that they are 28Mb/s rather than 24. But 28 Mb/s with Dolby Digital audio plays fine! I know I can just use the Dolby Digital option, but that doesn't help the day of footage I lost yesterday. without any success. Hopefully it's something stupid and easy! Hi Mike. Sorry about the problems. I don’t know how to fix it but I’d like to point out a last-ditch all-else-fails workaround. Since the audio plays in the Sony player software, play it there and simultaneously record it with software that captures anything played by your sound card (like OpD2d). Import that wave into Premiere and sync by hand. Not pretty, but it should work. Hopefully some one around here knows how to do it right. Good-luck. It's not the end of the world (no lost money there), it was really just testing the new camera. I guess my test video will have to have cheezy muzak instead. Interestingly, it plays fine in Media Player Classic too - so these players "know" something that the rest of my software doesn't. I suppose I should've tested it before I went out and shot two hours of footag! I've been working with 1080i/NTSC and PCM audio (from an NX5) for a year without problems. I tried your file with PPro or Soundbooth CS5 and got no audio, at all. Also tried Cineform Neo and no luck there either. Have you contacted Adobe, yet? I'm fine with 1080i with PCM, 1080 25p with PCM, and all other combinations - all except 1080 50p with PCM. It's not a general problem with PCM, it's just that one framerate/bitrate setting. It's not an Adobe thing, none of my other software will pick it up (not even VLC), and Sony Vegas didn't help either. I suspect there's something different about the way the NX70 makes these files. The 50p/60p files are a unqiue, higher quality setting, and the exact combination of PCM with 1080 50p creates problems. You can't make 50p with PCM at lower bitrates, the option isn't there. Me too. 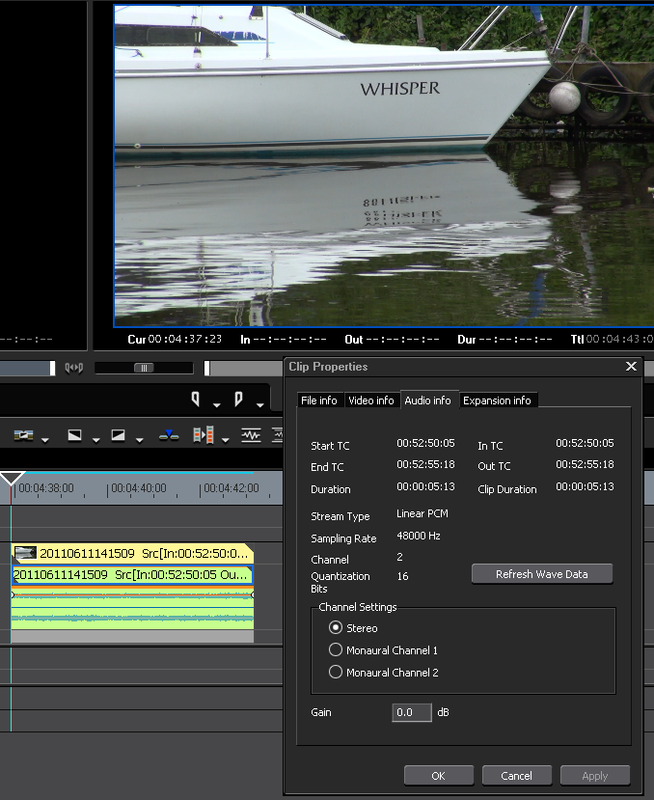 Just installed Premiere Pro CS5.5 on my mac and all my NX70 50p clips with linear pcm will not play back with audio. Record with dolby digital and it works fine. That's both good news and bad news. Good news that it isn't just me... bad news that the file format doesn't seem to be supported anywhere! At least I'm not going mad. 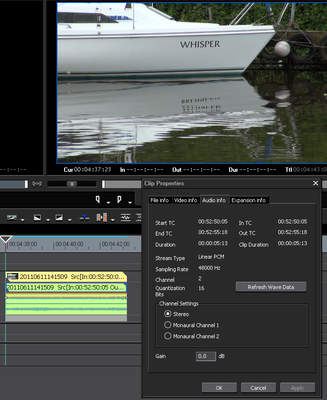 It is surprising that Sony does not have this this capability in Vegas Pro 10.x, its own NLE. Mike, I tried your 5 sec clip in my Sony Vegas Movie studio HD Platinum ver 11. I know I am just the newbe on the block but this software was my hope for editing footage from the NX70P. Well I can confirm that your file appeared to contain no audio. The video looked great and when I rendered it to 1920x1080 50p it took 17 seconds. Thats 3.4 :1 hell of a slow. I have a desktop intel i5-2500 cpu and 4G of RAM, HDD's 7200 rpm SATA 3. If this is a sign of things to come with 50p its going to test my confidence. I am just an amateur really creating movies of family and holidays so if I have to go with 1080i that will be OK, well not really!! It does need a more powerful PC. I haven't shot much 1080 25p or 50i, so I can't comment on those. The sound is fine in ordinary stereo mode, so that shouldn't be a huge problem (while we wait for the world to catch up with the file format). Hi Mike, the sound in your clip works fine in Edius 6.02. Thanks for that, at least it gives us hope! Maybe Adobe will catch up eventually, I don't fancy spending 500 quid on new software just now. I would say that L-PCM is definitely a more robust an audio recording format than Dolby/AC3. This is based on a year's work with LPCM from an NX5 with 1080i footage. Since my last post, I have also tried the footage with the latest Adobe PPro (ver. 5.5.0) and the latest Cineform Neo beta (551b327, and still find that neither will read LPCM with 1080/60p. I find it puzzling that Edius 6 reads this audio while even Sony's own NLE, Vegas 10(d), cannot do so.